1. It takes time, which I don’t have. 2. I have neither the space nor the desire to store $500 worth of mayonnaise and antacids. 3. I take my food seriously and coupons for real foods (produce, protein, and dairy) don’t really exist. So what’s a girl to do? I am pretty much bound to seasonal produce and often improvise a dish based on what’s on sale. I do prefer eating seasonal produce, but sometimes eating the same stuff for weeks on end becomes pretty lame. Thus was the case with corn. I just can’t pass up a good corn deal, and for the last 6-8 weeks it’s been 6-8 ears for $1. Insane – I can’t pass that up. Unfortunately, my family started getting really sick of corn (other than my daughter) – boiled, buttered corn is delicious, but it’s not a weekly staple. We had to revamp the corn. 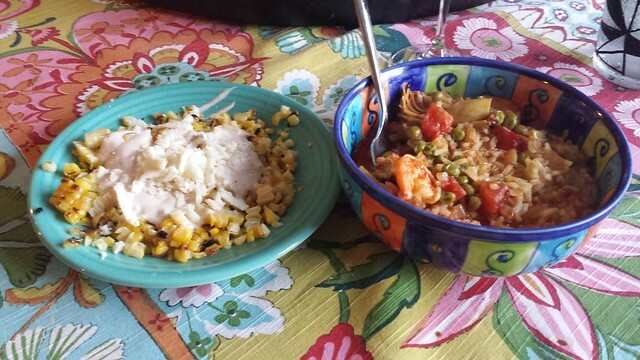 In came elotes – street corn! Grilled and sauced, it brings new life to lowly corn. You’ll start to think it SHOULD be a weekly dish – in fact, I might be sad when it becomes expensive again. I’ve had elotes from restaurants that was boiled corn with the elotes sauce – it’s fine, and in a pinch is still good, but if at all possible, grill the corn. We’ve served it on and off of the cob, and while it’s good both ways, it’s less of a mess to eat if you cut it from the cob. 1. Shuck the corn, heat the grill. Stir together the mayonnaise and sour cream until well combined. Add in the chili powder, paprika, and garlic salt. Mince or press the garlic and add the garlic and cheese to the sauce. Chop the cilantro and cut the lime into small wedges. 2. Place the corn directly on the grill, turning frequently (8-10 minutes) until all sides are nicely charred. 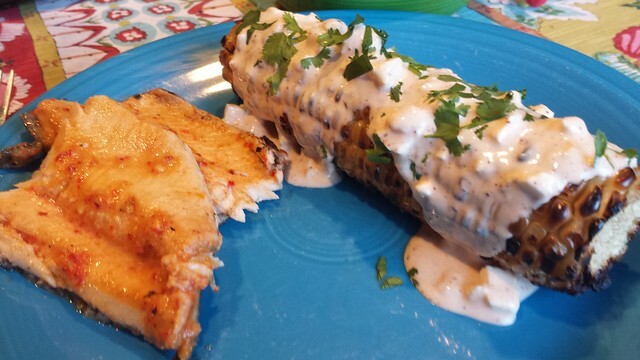 Cut the corn from the cob and serve with the sauce, a squeeze of lime, and a little cilantro.